Crafty escapism: The hunt for the Ultimate Crochet Sock begins! One of my lovely regular workshop students, who doesn't knit, told me recently that she had always wanted to make crochet socks. Around this time I discovered the marvelous Crochet Circle Podcast which I reviewed a few weeks ago here. Fay and Lynne, the hosts of Crochet Circle, mentioned another British podcast Crafternoon Treats so I had to check that out. Binge-watching back episodes of this podcast, I found out about their sockalong which started with a free crochet sock pattern Survival Socks by Elin Stoodley so I chose this to crochet along with my student. We had to do a bit of conversion to create an American version of the pattern. For foot size add 2 to UK sizes to get US sizes and for UK double crochet (dc) read US single crochet (sc). I'm British and even after four years in the US still have to rely on the Craft Yarn Council's conversion chart to change mms to American sizes for hooks and needle size. The pattern is really well written and I appreciated the photos in the survival sock pattern A LOT! When you're a novice sock maker you may not be able to exactly visualize where a gusset goes. I've only knit cuff down socks before and crocheted slippers so I really needed the visual. I've decided I like the toe up design very much so I can try it on as I go along. My gauge swatch was a bit off height wise so I had to modify the pattern a little before starting out. My foot widens as it goes up so I had to customize the sock with increases before the heel and then decrease before getting to the cuff but that's fine. Feet come in all different shapes and sizes and I'd expect some customization. My student's sock fits her well. 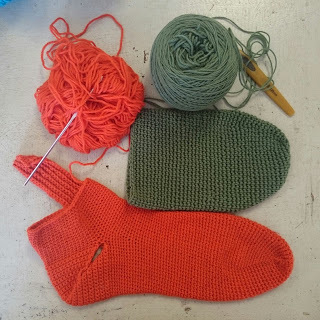 The photo shows where we are with the survival sock so far... We're make good progress! Before you go though, have a little listen to the latest episode of The Crochet Circle podcast: http://thecrochetcircle.podbean.com/e/episode-4-a-crochet-journey/. It made me laugh SO MUCH when around two minute in, Fay and Lynne started talking about my review. I wasn't ready for that! I've got to meet those ladies in person someday! They are so fun!